This post about Amazon Fashion March picks contains affiliate links. Please read this blog’s disclosure post for more info. Right now I’ve got midi dresses on my list. Also, mini dresses! As well as a cute denim skirt, bags that impress and cute shoes. I often email with community members here to discuss our Amazon finds. I’ve decided to start a regular feature on my latest Amazon purchases and wishlist additions! Kicking things off, Amazon Fashion March picks below. 1 || Last year’s version of this dress was aqua-tinged, this year it’s pink that makes up the base color. This lovely mini fits like a dream and looks fantastic under motos, military jackets or field jackets. OOTD coming up soon, you can see all my OOTDs here! 2 || I want a flare-sleeved dress but don’t want to spend too much on such a trendy item. This dress fits the bill perfectly. It’s on my wish list. 3 || Who doesn’t love a pretty fit-and-flare dress? This one is perfect for work or weekend and one of my favorite Amazon Fashion March picks. 4 || I’m swooning over the beautiful neckline details of this dress. I love that the open area isn’t too revealing! 5 || I always mention these moto leggings because they’re such a wardrobe staple. I wear mine at least 3 times a week! Luckily, only my very eagle-eyed coworkers seem to notice. They’re so easy to style differently with the various tops, blouses and sweaters in my closet. 6 || Sunglasses are a must for Spring driving! I would love to keep this pair in our Jeep. 7 || Crop jeans are back this year and this slightly distressed pair is in my cart right now. 8 || On the hunt for a lightweight jacket? This is the one I’d suggest. 9 || Denim skirts are classics, and they also happen to be on-trend this Spring! I’m looking for one button-down style, perhaps this pencil skirt? 10 || I adore the wrap styling of this bowed blouse! 11 || A skirt so nice I’ve listed it twice — firstly, the indigo wash has a more versatile vibe. Generally speaking, with tights under it, it’d be fine in my casual office. 12 || At the present time I’m noticing camisoles on many friends and coworkers for the office — this one has a higher neckline that makes it more office-appropriate. I like to wear mine under a plaid button-down. 13 || Meanwhile, the light wash of the skirt also listed in #11 reads more casual for weekend. Pair it with a grey v-neck tee shirt. 14 || This striped Fossil bag has appealingly Springy colors. 15 || Stuart Weitzman almost never goes below $150, yet here’s a pair of their ultracomfy pumps for just about $100! 16 || Circle bags are one of the must-have accessories for Spring and Summer. Ultimately, if you don’t want to spend a ton on a trend, this bag is one of my Amazon Fashion March picks that presents the biggest value for your dollar. 17 || In due time for warm weather events, I’m excited to show off my toes in these heeled sandals! 18 || Currently drooling over this bag, in my cart. 19 || Wrapping up this roundup is a pair of comfy and cute loafers that are worth a closer look. Like Amazon Fashion but feeling completely overwhelmed by the selection? 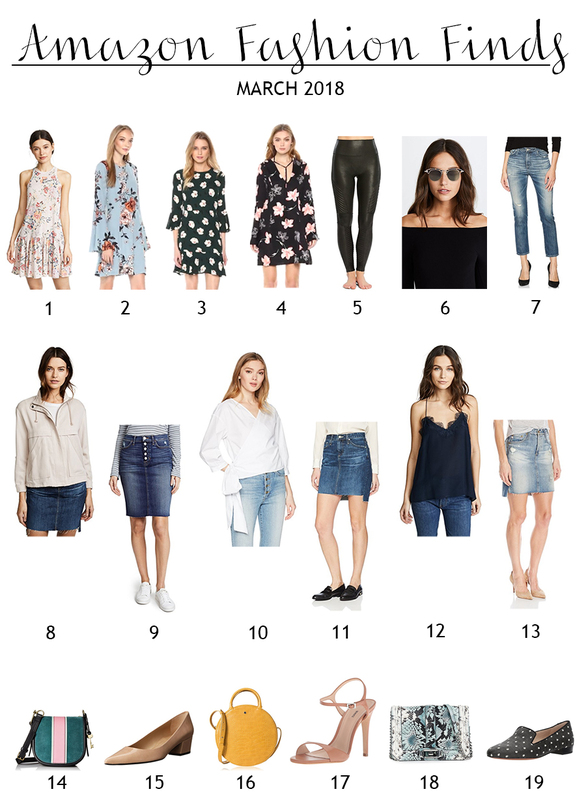 In this post, I explain how to search and refine to make shopping on Amazon Fashion effortless and fun! Previous Post Anthropologie’s late March sale adds new items! Great picks! I love the prints and designs for spring at an affordable price! Thank you! Amazon is great for finding good deals, even on the designer stuff I want. Looking forward to seeing you style the Rebecca Taylor mini! I too purchase quite a bit on amazon. I'll be sharing an Instagram of it later this week! Not sure exactly when I'll share the OOTD post quite yet.